Chicken Satay with Peanut Sauce is always a must try at Thai restaurants. But now it’s time to start making it at home! This chicken satay is so flavorful, and the peanut dipping sauce just takes these over the top. Then that delicious light char from the flames of the grill gives them that depth of flavor we all crave. You’ll definitely want to add these to your summer menu! 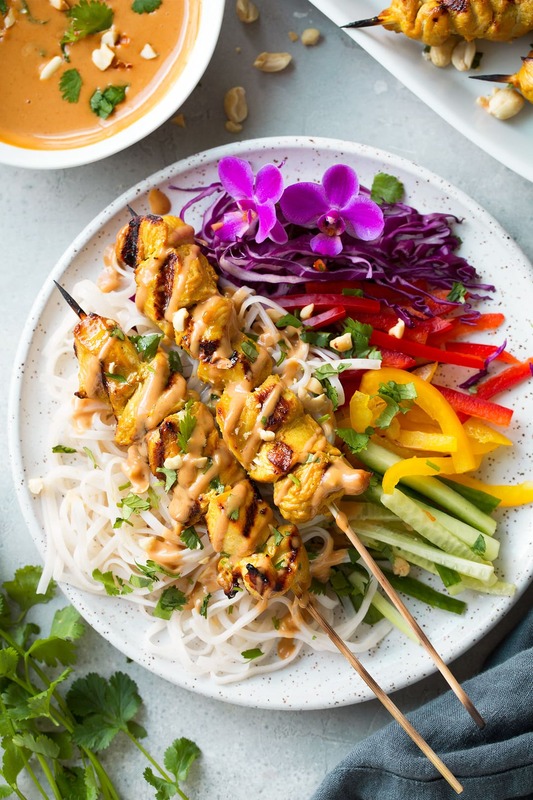 This Thai chicken satay with peanut sauce is not only super easy to make, but it also tastes delicious! 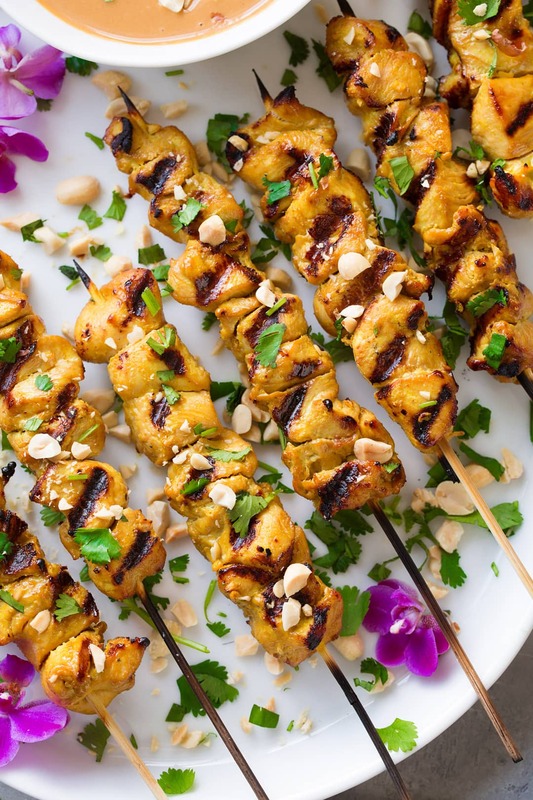 This chicken satay can be made indoors with a grill pan, or outdoors on an actual grill. Although this recipe takes 90 minutes to finish, only 30 minutes of that time is spent doing hands on prep work. But don’t think you can skimp on the marinating time — the hour in the fridge is what gives the chicken so much flavor! These juicy chicken skewers always wow kids and adults alike, and the peanut sauce usually disappears in no time. I think out of all Thai food, peanut sauce is my favorite. I don’t know what it is — maybe my love for peanut butter? — but I could eat it by the spoonful! I know the recipe may look like a lot of ingredients, but it really is easy to make. Plus, it’s mostly just staple ingredients you likely already have on hand. Normally, I’d also add some ginger into the peanut satay sauce, but since there’s plenty in the marinade I skipped it. But if you are making this peanut sauce for another recipe, add in 2 teaspoons of ginger. First you’ll make the marinade, then you’ll dice up the chicken and add it to a resealable bag along with the marinade. Let that rest in the refrigerator for at least 1 hour. Preheat a grill and thread the chicken onto skewers. Clean grill grates and brush the grill lightly with oil then place chicken on grill and cook through, turning once halfway. While the chicken is grilling, make the peanut sauce. 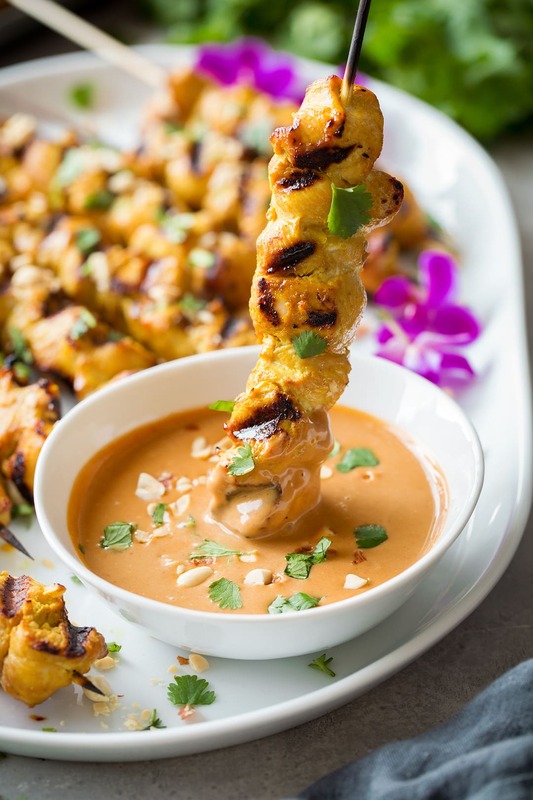 Serve chicken satay warm garnished with cilantro and dip in plenty of peanut sauce! Will I Taste the Fish Sauce in This Recipe? No, these chicken skewers won’t taste at all fishy. The fish sauce adds a lovely umami flavor to this recipe and gives these skewers an extra something-something. You can marinate the chicken up to 6 hours. If you leave it in the satay marinade any longer than that, the chicken will likely start to toughen up. 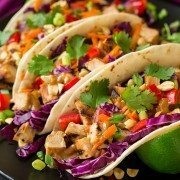 Serve these with colorful fresh veggies (grilled, sauteed or raw) and rice (brown, white, coconut rice or rice noodles) to finish off the meal. If you’re using wooden skewers, soak them in water for at least an hour to prevent them from splintering in the chicken or burning on the grill. Use freshly squeezed lime juice for the best flavor. 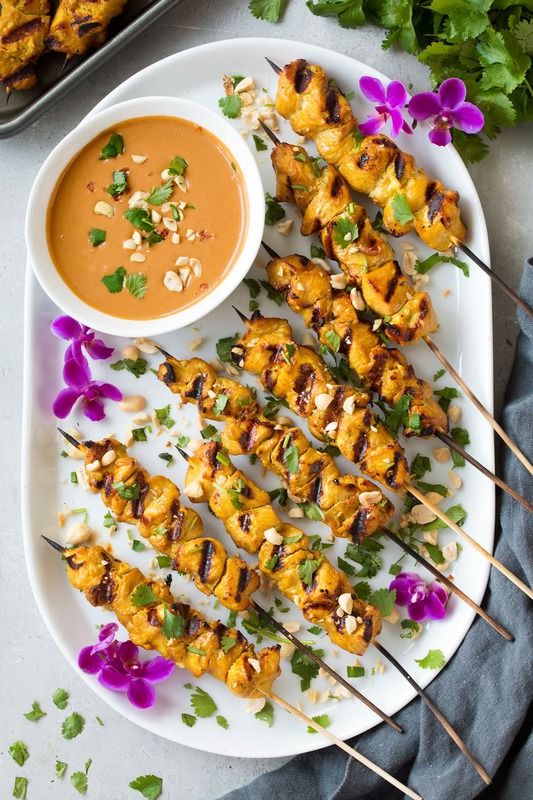 Chicken pieces soaked in a flavorful thai marinade then they're threaded onto skewers and grilled, and to finish them off they are paired with a rich and satisfying homemade peanut sauce. I like to cut the chicken into cubes for this recipe but if you want to keep it more traditional you can do strips instead. 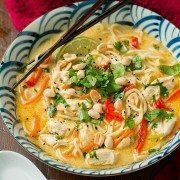 In a mixing bowl whisk together coconut milk, soy sauce, lime juice, fish sauce, brown sugar, ginger, garlic, coriander, cumin and turmeric. Place chicken in a gallon size resealable bag, pour marinade mixture over chicken, seal bag while pressing out excess air. Transfer chicken to refrigerator and let marinate at least 1 hour and up to 6 hours. Preheat a grill over medium heat to about 375 degrees and clean grates. Remove chicken and thread onto skewers, adding about 6 or 7 pieces to each (you'll need approximately 11 - 12 skewers, see notes if using wooden skewers). Brush grill grates with oil then place skewers on grill and cook until chicken registers 165 in center, about 5 - 7 minutes per side. 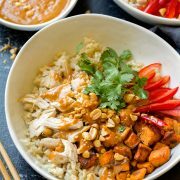 While chicken is cooking prepare peanut sauce, in a mixing bowl whisk together all peanut sauce ingredients while adding more water to thin if needed. Serve chicken warm garnished with cilantro and serve with peanut sauce for dipping. If using wooden skewers I like to let them soak in water overnight so they don't burn up and break apart. Be sure to soak them at least 1 hour if you didn't plan that far ahead.